Made from high-quality leather ranging from 7-8 oz. to 13-15 oz., our wholesale leather greaves serve as impressive pieces of leather armour for LARPing and SCA events. 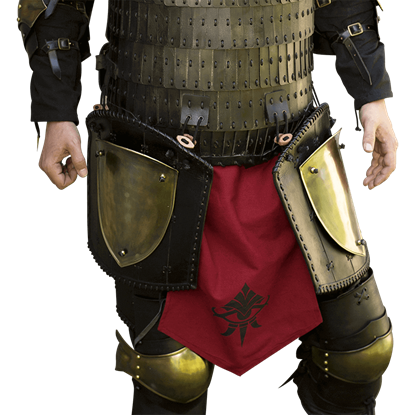 Our wholesale leather leg armour comes in a variety of styles that suit many fantasy looks, medieval knights, pirates, Viking warriors, and other popular re-enactment characters. 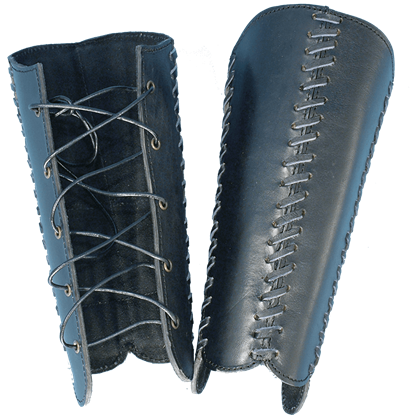 Many of these leather LARP greaves match other pieces of our wholesale leather armour, such as our leather bracers. 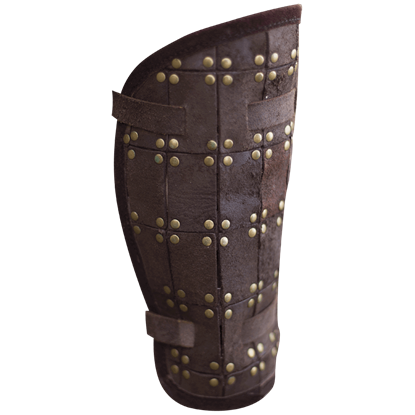 The growing selection of wholesale leather leg armour at LARP Distribution features excellent leather gear for protecting the knees, shins, and thighs. Our wholesale leather armour combines leather cuisses and leather poleyns to form complete coverage of the upper legs and knees, made from high-quality leather up to 13-15 oz. Suitable for a number of characters ranging from medieval knights to other fantasy and historical warriors, these leather products made an excellent alternative to our wholesale steel armour. Designed to protect the upper thighs in combat, the Ratio Thigh Guards are crafted from top-grain leather, leather stitching, and shield-shaped steel plates. The leg armour protects without slowing you down with unnecessary weight. A cloudless sky blesses the quest for adventure. A Northern army seeks warriors to aide a noble cause. Perhaps the role of mercenary or rogue awaits you. Whatever path you choose, the RFB Fighter Greaves completes a solid defense. 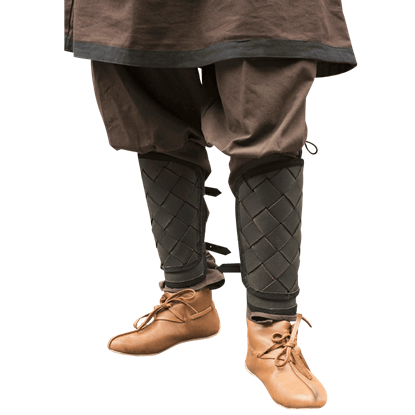 The Squires Leather Greaves are ideal for LARP use and even theater productions or plays. They are made from segments of leather that are sewn and laced together. The greaves are backed with a soft suede for comfort when wearing.